Alyssum Sweet Lobularia Maritima is a hardy annual native to Southern Europe. Sweet Alyssum is very easy to grow from seeds, and other common names of this plant are Sweet Alison and Seaside Lobularia. This Alyssum variety is a compact, rapid-growing annual plant that produces dense clusters of fragrant, crisp-white flowers. Alyssum re-seeds itself heavily blooming all year round in mild, frost-free zones. 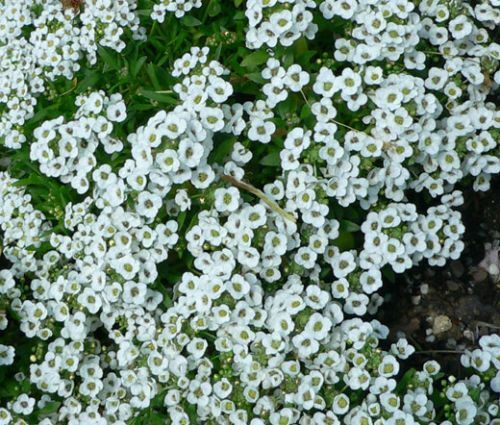 Sweet Alyssum is traditionally used for edging flower beds, borders, rock gardens, hanging baskets, and as an annual ground cover. Lobularia Maritima thrives in full sun to partial shade tolerating drought and heat, and Alyssum adapts virtually to any type of soil.